Clean prawns and marinate it with ginger paste, garlic paste, pepper powder, turmeric powder, 1 egg white, 1 tsp soyasauce and salt and keep for 30 minutes. Heat oil in a pan and fry the prawns and keep aside. In the same oil add onions and green chillies and saute for few minutes till soft. Add chopped capsicum and saute. Perfectly done and so scrumptious! Yummmm :) Looks so delicious!! 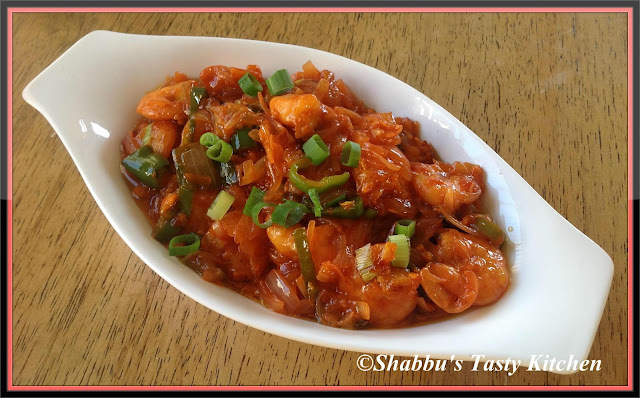 Super tempting and irresistible chilli prawns, cant take my eyes from ur click. Hi Shabana the recipe looks delicious. My husband is crazy for prawns so i will surely try this. Do visit my space in your free time. glad to follow you dear. look super yummy. just bookmarked this one. Yummy prawns..my favourite among the sea food. Plz click on the link and checkout my guest post.. do leave a comment there..
Nice , looks so tempting and great pics:)Happy to follow your blog. looks so delicious and the presentation is superb..